Powered by the late generation of Intel® Atom™ processor E3845 (also known as "Bay Trail-I"), the TaskRunner 105-E3845 industrial fanless computer features the 64-Bit Instruction Set and Intel® HD Graphics. Large DDR3L memory, plenty of high-speed interfaces as well as its small mechanical design well suit it for compact performance applications, such as Factory Automation Applications, Network Applications and Communication Applications. Windows 7/10 and Linux are supported. The Intel® Atom™ CPUs (4 cores at 1.91GHz) combined with up to 4GB high speed DDR3L memory assembles an affordable system for compact demanding industrial applications. The on-processor graphic unit provides 1x HDMI port and 1x DVI-I port enabling up to 2 independent displays simultaneously. Two digital or one digital plus one analogous display (VGA via DVI-I) are possible. The connectivity includes 2x GbE LAN ports, 4x COM ports, 1x CFast / 1x SIM card holder, 1x USB 3.0 and 2x USB 2.0. 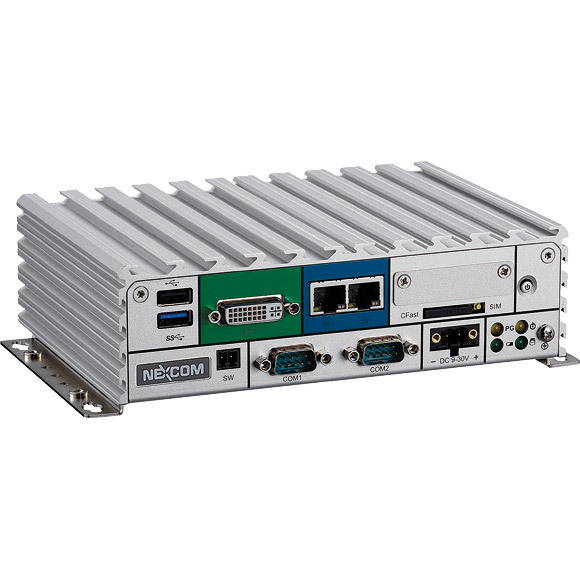 One integrated Mini-PCIe slot can accommodate WLAN or 3G/4G-Modem card. Power input 9-30V DC, wide temperature operating range and ruggerized compact aluminium housing recommend it for deploying in harsh industrial environments.